A fantastic selection of 20 mobile casino games awaits players at JackpotCity Mobile, including 4 excellent progressive jackpot slots that offer huge payout possibilities. The casino runs on Microgaming’s Spin 3 software platform, and it supports a a vast range of mobile devices. Regular promotions give players a boost, and a loyalty program helps them cash out even more. The Spin 3 software that powers JackpotCity Mobile was developed by Microgaming, one of the top producers of online casino software. Getting started is simple. First, players should check to see if their phone is supported. Most modern devices are compatible, including iPhone, Blackberry, iPad, Android, Palm, and Windows Mobile. 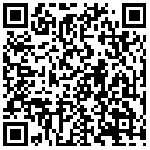 To load the software onto their phones, players just need to enter their mobile number on the casino’s webpage. Once the software is installed, players register an account right from their phone. 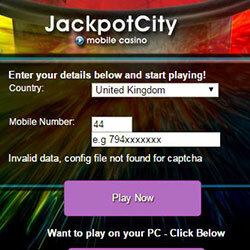 The range of games offered by JackpotCity Mobile is impressive. It is a bit heavy on mobile slots, but many of Microgaming’s most popular titles have been fixed up to work well on mobiles, including Tomb Raider, Major Millions, and more. Other games include keno, scratch card, video poker, and table poker. The casino’s mobile blackjack is a great single-deck variation that looks surprisingly good even on the tiniest mobile phone screens. 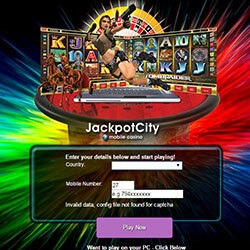 The benefits package at JackpotCity Mobile is quite a lot bigger than most mobile casinos offer. When signing up with the casino, new players are offered a welcome bonus up to £500 on their first two deposits. The benefits continue with daily bonuses sent to players by SMS – the quality of these bonuses depends on how much players deposit and play. A Loyalty Points system helps casino members earn a little cash back on every wager they make. The quality of service, the game selection, and the variety of bonuses offered by JackpotCity Mobile make it one of the top mobile casinos around. Their device compatibly is excellent, so most players with phones purchased in the last few years will be able to enjoy top-quality casino games on-the-go. They only offer one blackjack game, but the ability to put blackjack in your pocket is not something to turn away from!